The Rockport Film Review: Take a Ride with "Christine"
Take a Ride with "Christine"
Stephen King has brought us stories of possessed Dogs, Cats, and werewolves, now we move on to inanimate objects like the bright red 1957 Plymouth Fury in “Christine”. Can a car have a mind of its own? Most definitely, but can it kill people, well that would make for a good story. Directed by the master of horror himself John Carpenter, who just 5 years earlier debuted “Halloween” that changed horror movies forever. 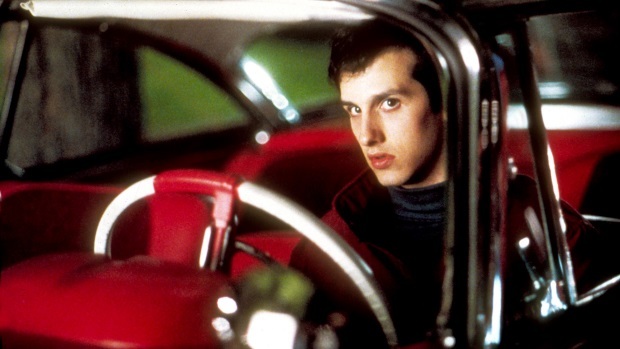 Arnie Cunningham, played by Keith Gordon, is the epitome of the nerdy high school student, even his hame screams dorkiness. Although he is best friends with Dennis the quarterback of the football team. Arnie then has a serious run-in with the school's motorhead bullies with their leader the ironically name Buddy. Buddy, who looks about 30 years old, whips out a switchblade and terrorizes Arnie only to be saved by Dennis. Dennis drives a hot muscle car and Arnie wants to get one for himself. He finds a rusted out and beat to hell ’57 Plymouth Fury in an old man's junkyard and has an instant connection with it. The 20-year-old car has a history, in the movies opening scene we see the car rolling off the assembly line and taking its first victim. Arnie’s parents are not too keen on him having the car and forbid him from keeping it at the house, so he brings it to a big garage where he can restore it. He strikes a deal with the gruff and greasy shop owner and Arnie gets to work. 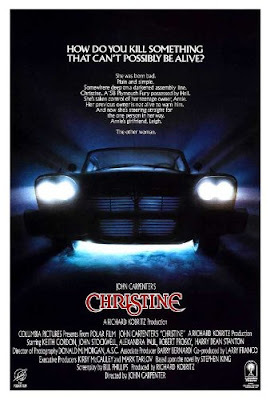 Although the premise of “Christine” sounds a little ridiculous and in the wrong hands could be really bad, Carpenter and writer Bill Phillips turn Kings novel into a decent movie. The idea that people, especially men, can get obsessively attached to their cars to the point that it changes their attitude and behavior is quite believable. Arnie eventually restores the car to like new condition. Arnie also starts to change, he does away with his glasses and adopts an edgier and rebellious personality. He also starts going out with the prettiest girl in school, Leigh, played by Alexandra Paul. Noticing Arnie’s transformation and new reputation with his hot new car, Buddy and the guys absolutely trash Christine an even take a crap on the dash (nice touch!). Furious and defeated, Arnie looks to get revenge and nobody wants it more than Christine, who in a bit of cool 80s special effects fixes and restores herself. Arnie is completely under Christine’s spell and nothing else in his life matters. The bullies start showing up dead and detective Rudolf Junkins, played by Harry Dean Stanton, start poking into Arnie’s business. When they see their friend going off the deep and acting all crazy Dennis and Leigh try to help Arnie, but is too far gone? Has Christine claimed yet another victim? “Christine” is an interesting movie in that it's not really a horror movie, it’s not gory or all that suspenseful, but it has strong characters and is a well-written teen thriller. They wanted the movie to be rated “R” so they actually had to add in a lot more swearing and dirty language to achieve it. It’s a movie that a lot of people who grew up in the 1980s can remember seeing and like a lot of other Stephen King movie holds a special place in peoples lives. Stephen King's "Pet Semetary (1989)"